Oregon Chardonnay Gaining Prominence Recently Tasted Oregon Pinot Noir Adelsheim Vineyard Breaking Ground Pinot Noir Celebrates 45 Years Pinot Briefs Will the Bloom Fall Off The Pinot Grape? •Vineyard manager, winemaker and director of sales, marketing and accounting at Adelsheim. •Early experimental work on clones at Lycée Viticole in Beaune, France and at The Eyrie Vineyards. •One of the instrumental figures in bringing the Dijon clones of Pinot and Chardonnay to Oregon. •Work on Oregon wine labeling regulations. •Assisted in the establishment of statewide and regional wine industry organizations such as the International Pinot Noir Celebration (founder and Burgundy ambassador), the Oregon Pinot Camp (co-founder and first president), and Willamette, the Pinot Noir Barrel Auction. •Brought life to the Oregon Wine Board and served as first Chairperson and as an appointee by Oregon’s Governor to the Board for eight years. 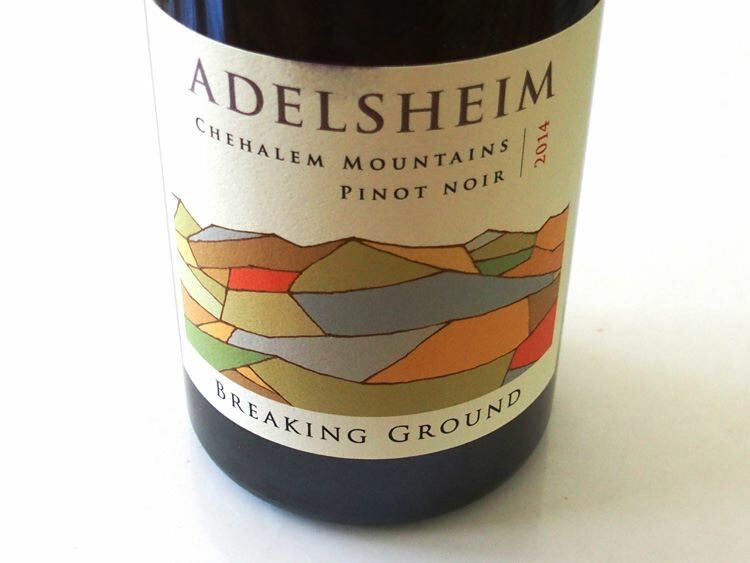 To celebrate David’s 45-year commitment to Oregon’s Chehalem Mountains, Adelsheim Vineyard is releasing a special Pinot Noir from the Chehalem Mountains labeled “Breaking Ground” in July 2016. The name Breaking Ground reflects David’s desire to both stay in the forefront and continuously raise the bar of his brand and the visibility of the Oregon’s wine industry. The wine is made entirely from LIVE-certified Chehalem Mountains grown fruit from all three major soil types found on the Chehalem Mountains - marine sedimentary, volcanic basalt and windblown loess. The Breaking Ground Pinot Noir ($45) will be sold in retail outlets and restaurants in the United States and globally. LIVE was formed in 1995 by a small group of winegrowers from Oregon's Willamette Valley. 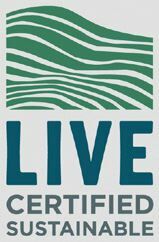 In 1999, LIVE was incorporated as a 501(c)(3) not-for-profit organization to independently certify the sustainable practices of winegrowers and wineries in the Pacific Northwest. LIVE uses a comprehensive set of rigorously applied, science-based standards and procedures that ensure both wine grape farming (vineyards) and winemaking production (winery) are as sustainable and have as minimal an environmental affect as possible. LIVE certification is one of the most authoritative sustainability accreditations in the wine world, requiring LIVE members complete a series of reporting requirements each year on their vineyard and winery to confirm their compliance with LIVE standards. LIVE Wines are independently certified to meet strict international standards for environmentally and socially responsible grape growing and winemaking in the Pacific Northwest. Currently, there are 316 vineyards (7,070 acres) and 41 wineries that are Live Certified Sustainable. Logo for websites, farm and winery signs, not labels. Logo for wines made from at least 97% fruit that meets vineyard certification requirements. Logo for wines made in a LIVE-certified winery from at least 97% fruit that meets vineyard certification requirements. The winemaker at Adelsheim Vineyard since 2001 has been Dave Paige, a graduate of the University of California at Davis and the viticulturist and vineyard manager since 2006 has been Chad Vargas who holds BS and MS degrees in Crop Science and Plant Pathology. 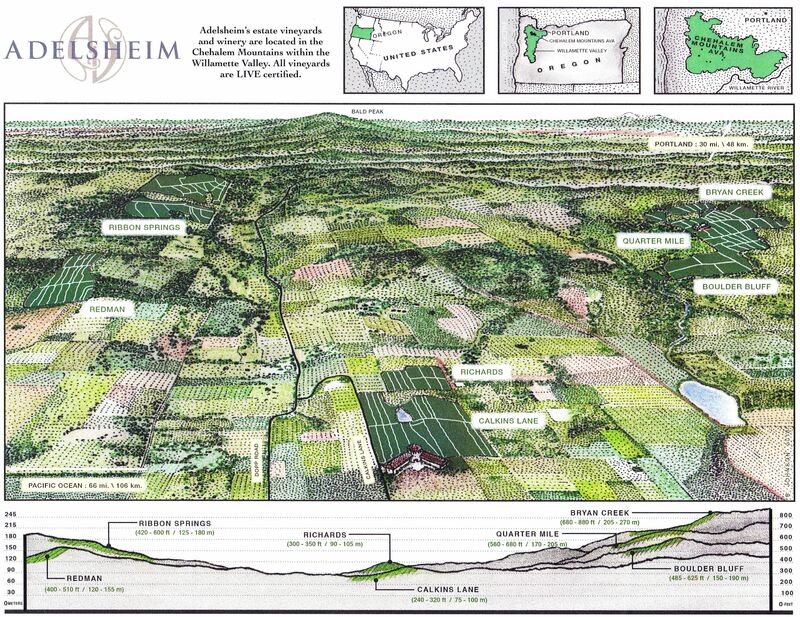 Adelsheim Vineyard is one of a few Oregon wineries open to the public 360 days a year. Visit the website at www.adelsheimvineyard.com.